Indian captain Mahendra Singh Dhoni today came to the rescue of out-of-form predecessor Rahul Dravid, saying it was nothing new and every player went through bad patches in his career. the one-dayer in Nagpur. Tendulkar scored a fluent 72, while Ganguly made an impressive 86. Describing S Sreesanth as an "accident waiting to happen", former Australian captain Ian Chappell has urged the BCCI to discipline the Kerala pacer before he becomes another Shoaib Akhtar. Australian all-rounder Andrew Symonds has added fuel to his simmering duel with Indians by describing the ongoing tour as "hostile" and warning the team of a backlash when it tours Down Under this year. South Africa batsman Jacques Kallis return to the side with a bang getting back-to-back man of the match award and in the process becoming only the 23rd player in history to achieve 900 rating points in the LG ICC Player Rankings for Test batsmen. Russia's Elena Dementieva gave herself an early birthday present when she came from behind to beat Serena Williams 5-7 6-1 6-1 and win her maiden Kremlin Cup title today. A spectacular show of sporting camaraderie, made more enthralling by some daredevil performances and showcasing of diverse cultural heritage of the country, marked the grand opening ceremony of the 4th World Military Games here this evening. India reached the quarterfinals in men’s football, while they were held to a 30-30 draw by Turkey in men’s handball at the fourth World Military Games here today. Jyoti Randhawa displayed superb form when it mattered the most to retain the title in the Hero Honda Indian Open Golf Championship at the Delhi Golf Club course this evening. Jyoti carded a three-under 69 for an overall score of 13-under 275. Indian driver Armaan Ebrahim on Sunday secured a commanding win in the Grand Race of the Formula Renault V6 Asia Championship on the Autopolis circuit in Japan. Punjab raced to a comprehensive nine-wicket win against Haryana with a day to spare in a league match of the North Zone inter-district (u-22) cricket tournament for the CK Nayudu Trophy at the Dhruv Pandove Stadium here today. Australia today relied on an all-round display to clinch the one-day series with a 18-run victory over India in the sixth cricket one-dayer which saw the hosts frittering away a solid start and running out of steam in the slog overs. After scoring a mammoth 317 for eight built around Andrew Symonds rollicking unbeaten 107, the Australians held their nerve to restrict the home team to 299 for seven and take an invincible 4-1 lead in the seven-match series. The trusted opening pair of Sachin Tendulkar (72) and Sourav Ganguly (86) provided the foundation for the chase with a 140-run stand, but the Indians lost the plot in the middle overs to allow the asking rate to climb beyond manageable limits. Robin Uthappa (44 off 28 balls) and skipper Mahendra Singh Dhoni (26 off 29 balls) made a last-ditch effort to overhaul the target but both perished in quick succession in the 49th over to leave India stranded. Left-arm spinner Brad Hogg was the pick of the Australian bowlers with impressive figures of four for 49 on a good batting strip at the VCA Stadium. Mitchell Johnson, who bowled a maiden in the 49th over, chipped in with two for 39 while Man-of-the-Match Symonds followed up his batting exploits with an economic spell of 10-0-39-0. The home team stared defeat in the face after losing their top five batsmen with 218 on the board in the 41st over, but Uthappa played a superb cameo to raise visions of a great victory. But his dismissal in the 49th over followed by the departure of Dhoni ended the Indian challenge at 299 for seven, much to the disappointment of a capacity holiday crowd. The sixth wicket duo brought India close by raising 72 runs in only 46 balls before departing in the space of four balls. The hosts had lost the moorings after the Tendulkar's dismissal, stumped off Hopes, and lost the wickets of Ganguly, pinch-hitter Irfan Pathan (29), the out-of-form Rahul Dravid (7) and Yuvraj Singh (6) between the 33rd and 41st overs. However, the Australians kept their nerves and emerged victorious to sweep to a series victory. India need to blame themselves for allowing Symonds to bludgeon his way to a match-winning 88-ball 107 by letting him off twice. Symonds, who started slowly before pulverising the bowling with audacious shots, came to the crease when the Aussies were wobbling a bit at 102 for three in the 16th over. He added 75 runs for the fifth wicket with Brad Haddin, back into the eleven for the injured in-form opener Matthew Hayden, and then 90 for the next in 48 balls with Hopes (39). But three dropped catches, with the culprits being S Sreesanth and Harbhajan Singh (off his own bowling), and Dravid (who let off Gilchrist on 16 in 28 for one), cost India the match. Australia got off to a flying start, after the loss of makeshift opener Michael Clarke in the first over, through a breezy 96-run stand in only 85 balls between the Gilchrist (51 in 47 balls with 8 fours) and Ponting (49 in 44 balls with 7 fours and a six). But the fall of the two well-set batsmen in a short span put the Indians back into the game, before Australia rallied around through the hard-hitting Symonds who smashed four huge sixes off the spinners. India began the run chase pretty confidently with Tendulkar and Ganguly giving the charge to Mitchell Johnson and Brett Lee. A flurry of boundaries flowed off the bat of the two senior batsmen who went on to notch their 21st century opening stand. But Tendulkar once again fell when poised for a century. He lunged out to Hopes and could not regain his crease after missing the ball and was stumped smartly by Gilchrist. There was then the inexplicable decision to send in out-of-form Dravid at the fall of Pathan and the momentum of the innings climbed down drastically with Ganguly too having slowed down at the other end. Both batsmen perished in identical fashion, holing out in the deep while trying to clear the fielder. Fall of wickets: 1-2, 2-98, 3-102, 4-129, 5-204, 6-294, 7-315, 8-317. Bowling: Zaheer 10-0-62-2, Sreesanth 8-0-64-1, Pathan 9-0-60-1, Harbhajan 8-0-56-1, Kartik 9-1-37-1, Yuvraj 1-0-15-0, Tendulkar 5-0-20-0. Fall of wickets: 1-140, 2-189, 3-203, 4-213, 5-218, 6-218, 7-290. Taking a serious note of allegation of racist chanting against Andrew Symonds, the International Cricket Council has demanded the BCCI's explanation on the incident reported in the media after the fifth one-dayer in Vadodara. "We have noted media reports of racist chanting during the India-Australia ODI in Vadodara on Thursday and also of racist abuse directed at South Africa players and team officials in Lahore," ICC Chief Executive Malcolm Speed said in a statement. "In the light of those reports we have written to both the BCCI and the PCB (on Saturday) asking for their comments on the incidents," he said emphasising ICC's "zero tolerance to racism". Symonds had complained of 'monkey chants' from a section of Vadodara crowd when the all rounder was fielding near the boundary. But the Cricket Australia had refused to lodge an official complaint with the ICC and left the matter to the BCCI to handle, saying the ICC's anti-racism policy clearly states that it is the home board's responsibility. Speed also said the ICC's anti-racism "Code outlines measures host members are expected to undertake and those measures were unanimously approved by the ICC's Board. "We need to understand whether those measures are working. If they are not then our members need to tell us why so we can ensure cricket remains free from the scourge of racism." Speed said the games governing in its next meeting in Dubai would also discuss if the issue of racism was being addressed properly. "With the ICC Board set to meet in Dubai at the end of this month there is scope for discussion on this subject then, if appropriate, to ensure it is properly addressed on an ongoing basis," he said. However, match organisers Baroda Cricket Association and the local police have vehemently denied the allegations that Symonds was racially abused during the match there. Vadodara Police Commissioner PC Thakur told PTI that the crowd occasionally chanted "Ganapatibappa Moriya", which might have led to the confusion. The crowd was chanting that after Indian wickets kept falling. They did not expect their team to lose and did not spare some of the Indian players either. But none uttered a single word against any Australian player," Thakur said. The BCA secretary Rakesh Parikh also dismissed charges of racial abuse. "The crowd chanted 'Ganapatibappa Moriya' hoping for some divine intervention and none of them passed any racial remark against any Australian," he said. Australian captain Ricky Ponting yesterday hit out at the racist remarks alleged to have been uttered at teammate Symonds in Vadodara and said racism was unacceptable globally. Dravid was sent in at number four ahead of Yuvraj Singh, Dhoni and Robin Uthappa but managed only seven runs off 13 balls when the situation demanded quick scoring. But the skipper defended his decision saying the former captain was originally slated to come in at number three. "Rahul was padded up for long to bat at no three. Then I promoted Irfan to number three and, when he was out, sent Rahul. It's true he's been struggling a bit of late, but that has happened to all of us, including Sachin. He also did not get the strike in the beginning," Dhoni said at the press conference after the 18-run loss in the sixth ODI which handed Australia the series. "By the time he went out to bat, the asking rate had already climbed to 7.5 and it's not easy for a new batsman to cope up with it," said Dhoni. Dravid, with a tally of just 44 in the series before today, came in at 189 for 2 after the 33rd over and was fifth out at 218 in the 41st over. Dhoni rued the missed catches off man of the match Andrew Symonds, who smashed an unbeaten 107 off 88 balls, as one of the main reasons for the defeat. "We let off a couple of catches of Symonds and we never got the wickets when we needed them. When we batted we had a good opening stand (of 140 between Sachin Tendulkar and Sourav Ganguly) but then kept losing wickets when partnerships were needed later," he said. "By the time I and Robin (Uthappa who made 44 off 28 balls) came together the asking rate had climbed to over 10 and it's never easy," the wicketkeeper-batsman said. Dhoni admitted that the home team had not performed well in all the departments of the game together in the matches, barring the one at Chandigarh. "We have not performed well in all the departments of the game at the same time except at Chandigarh where we did so and won," he said. The Ranchi-based player also said that the Indian bowling at the death and batting between the 20th and 40th overs needed improvement. "We bowled well at the death in South Africa (in the Twenty20 World Cup) but did not do well in England. Here too we have not bowled well at that stage. "We need to improve on this aspect. We also need to keep wickets to enable us to score in the region of five to 5.5 between the 20th and 40th overs to have the chance for a charge at the end," he explained. Asked why he did not bat at number three himself, Dhoni said he was not confident of doing so against the new ball due to lack of practice. "But you may see me coming in at No. 3 in the next series. I am going to practice for that," he said. Dhoni singled out left-arm wrist spinner Brad Hogg as the key bowler in the Aussie line-up but said he came on at a good situation in the match. "If the BCCI needs any prompting on why they should discipline Sreesanth before he has a major crash, they only have to look at Pakistan's mishandling of Shoaib Ahktar in his early days," Chappell was quoted as saying in the 'Cricinfo'. Chappell said if Sreesanth continued with his aggressive ways one day he would be in serious trouble and the BCCI needed control the bowler. Symonds, who is engaged in a war of words with the hosts since the seven-match series began, said he knew India was "never an easy place to tour, but I am surprised how hostile it has been". The all rounder, on his fifth tour of India, said the 'World Twenty20 champions' still had a lot to prove and were set for a searing summer in Australia. "They're saying they've built up this new Indian team, but we'll see how much they've changed at the end of our summer," he was quoted as saying by the 'Sunday Telegraph'. "We have had the edge on them here and we will get them again in Australia this summer. They've beaten us in a Twenty20 game and one one-dayer in four years. You can't gauge much on that, but we'll see how this so-called new Indian team goes on our soil," he said. On the crowd making 'monkey chants' at him during the fifth one-dayer in Vadodara, he said "I don't know what is going to transpire from what happened to me the other day. "I am a pretty liberal sort of bloke. But racism is a big issue in world sport, not just cricket. It is a sensitive issue and guys have been made an example of in the past, but what do you do in this instance if it's coming from the crowd? "I'm not allowed to comment on exactly what went on, but I'm not the most deadly serious bloke. Life goes on." 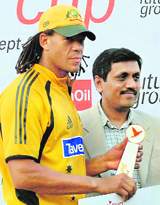 Symonds also said fast bowler S Sreesanth was frequently overstepping the mark of gamesmanship. "It is fair to say there is not a lot of love between us and Sreesanth. His carry-on in this series has been way over the top. We don't mind blokes having a go and standing up for themselves, but he has gone above and beyond what's acceptable. "It's one thing to play hard and use gamesmanship, but it's another to overstep the mark and that's what has happened on more than one occasion with him." Symonds said India might have some world class players but a team's success depended on how they gelled together. "They've got some world-class players but it's how they gel together. As soon as we spot one sign of weakness or selfishness, that's when we go in for the kill. "You don't become a great player overnight and it's the same as a team: you need sustained success to be respected. When other sides say you're a great side, that's when you're a great side," he said. Symonds said he was not impressed with Indian cricketers' behaviour. "We are not overly social with the Indian team, but I get on well with most of them. There are just a couple of them who seem to spark things. Sreesanth and Harbhajan Singh are the ones we are clashing with most. "The thing that annoys us the most is when they are going well, they will have a shot at you. But when they aren't going well, they forget to shake hands at the end of the game." Symonds also did not hide his irritation to see Indian cricketers in television commercials everyday. Kallis has joined the exclusive club following a prolific series against Pakistan, in which he scored three hundreds and a fifty in four innings, playing a key role in his side's 1-0 success after being cold shouldered for the inaugural Twenty20 World Cup. The right-hander's aggregate of 421 runs was the highest by any player in the series and his three hundreds have taken his career tally to 27, joint seventh in the all-time list alongside the Australia duo of Matthew Hayden and Allan Border. These figures have lifted him to his career-high rating, giving him the third place in the latest player rankings for Test batsmen. Kallis has moved ahead of Sri Lanka's Kumar Sangakkara and now has only Ricky Ponting of Australia and Pakistan's Mohammad Yousuf above him in the listings. The quartet all stand at 900 rating points or above, a tally achieved only if the player is prolific over a long period of time, and it is the first time in history that four batsmen have stood at 900 points or above at the same time. One player who never quite scaled the 900-point mark is Pakistan's Inzamam-ul-Haq, but he can still be proud of his facts and figures as he bids farewell to the Test arena. Dementieva, who turns 26 tomorrow, came out storming after losing the first set, breaking the fourth-seeded American three times in each of the next two sets to claim her first career win over the former world number one in emphatic fashion. The 14th-ranked Russian had not even won a set off Williams in their four previous meetings. The two players traded breaks several times in the first set before Williams broke to love in the 12th game to take a one-set lead. The games, being held for the first time outside Europe, were declared opened by President Pratibha Patil. Olympic silver medallist Rajyavardhan Singh Rathore ignited the games flame to mark the beginning of the eight-day mega event, touted as the biggest sporting event ever held in India. More than 6,000 athletes and officials from 102 countries got a thunderous applause from the spectators at the 25,000-capacity GMC Balayogi Stadium, which was filled up to two-thirds. Pledging to take part in the sporting extravaganza in the true spirit of sportsmanship, Indian contingent’s flag-bearer Tushar Tomar took the oath on behalf of all the athletes. This is the first time that more than 100 countries are taking part in the games. The evening saw athletes from the smallest competing country, Burkina Faso, to the biggest, Russia, walking together. Indian armed forces’ helicopter team Saarangi set the tone for the enchanting evening, showcasing Indian military’s efficiency and daredevilry by flying past the stadium four times in as many formations and showering petals on the spectators. This was followed by 11 daredevil paratroopers, including games mascot Bravo — the great Indian bison —descending on the stadium from 8000 ft.
An awe-struck Conseil International du Sport Militaire (CISM) chief Brig-Gen Gianni Gola called it a “magical and unique moment” in the history of the games. “You have done a miracle of bringing more than 100 countries to promote ‘Peace and friendship through sport’, the motto of the games,” he said in the august presence of President Patil, Andhra Pradesh Governor Narain Dutt Tiwari, Chief Minister Y Rajasekhar Reddy, Defence Minister K Antony Singh, three service chiefs and a hosts of other dignitaries. Reddy, who is also the chairman of the organising committee, promised to leave no stone unturned to make this event a success. The athletes will vie for 1205 medals in 13 disciplines — boxing, football, handball, judo, military pentathlon, parachuting, shooting, swimming, track and field, volleyball, wrestling, triathlon and sailing. The last two will be held in Mumbai. China’s contingent, consisting of 200 members, is the biggest, followed by India with 196 and the USA with 190. Requiring to win their last preliminary league match against Afghanistan in football, India managed to hold on to a 1-0 lead after a solitary goal in the fifth minute by Nguernilal to progress to the next stage from Group B along with Brazil and Qatar. Egypt, Ireland, Guinea, North Korea and Cameroon are the other countries to make it to the last-eight stage. Nguernilal converted a penalty kick awarded when he was brought down inside the box by Afghan defender Shoaib Yarsada. In handball, India put up a spirited show against a higher-ranked Turkey, and were leading 15-12 at the beginning of the second half. But Turkey’s Baris Dincturk and Bayram Sezgin scored in tandem and managed to level the score at 21-21. Germany became the first team to qualify for the European Football Championship with a 0-0 draw with Ireland, while Scotland made things a lot tougher for Italy and France. Scotland beat Ukraine 3-1 yesterday to retain the first place in Group B and increase the likelihood that one of the two World Cup finalists will be missing from next year’s tournament in Austria and Switzerland. France defeated the Faeroe Islands 6-0, but the team is still two points behind Scotland, who have 24 points. World champions Italy have 23 points after beating Georgia 2-0. England, Spain, Portugal, Sweden and defending champions Greece also won yesterday, while the Netherlands got beaten by Romania. Thierry Henry, who scored one of France’s six goals against the Faeroe Islands, tied Michel Platini’s national record with 41 goals. Karim Benzema scored two goals, while Nicolas Anelka, Jerome Rothen and Hatem Ben Arfa added the others for France. The 35-year-old Jyoti, who shared the lead with Chapchai Nirat of Thailand overnight, won his third Indian Open title to emulate Australia’s Peter Thomson. The Indian ace received a cheque for $79,250, while Chang Tse-Pen of Chinese Taipei, who had tied with three others in the fourth place overnight, pulled himself up with a card of four-under 68 (overall 10-under 278) to finish second and win a prize money of $54,250. Rahil Gangjee carded the day’s best score of 66 (eight-under 280) to finish third and earn $30,500. It was his best round of the season, including an eagle and five birdies. Australia’s Mitchal Brown (67) drew himself up to the fourth position. Chapchai carded a disappointing 76 to finish fifth along with three others -Lu Wen-Teh of Taipei, David Gleeson of Australia and Mark Brown of New Zealand. The Indians had a field day today with Arjun Singh, Ashok Kumar and SSP Chowrasia also finishing in the top 10 with five-under 283. Randhawa, a six-time winner on the Asian Tour, who had won the Indian Open for the first time in 2000 here, played with consistency and was in the cruise mode for most of the round, turning in 35 for a two-shot lead. Chang narrowed the gap to one with a birdie on the 17th, only to see Jyoti respond with an eagle on the par-four 16th. Jyoti was delighted to join the company of the legendary Peter Thomson, a five-time British Open champion. “I was thinking about it. Anytime you emulate a legend like Thomson, you know you have done something good in life,” said a beaming Jyoti. “The Delhi Golf Club course is my favourite, and I am happy that people came out in great numbers to support me. It has been a fabulous week,” he added. Though much was expected from Jeev Milkha Singh, he could finish only 13th, despite having his best round of 68 today, compared to 72, 74 and 71 on the first three days. Jeev finished with a score of three-under 285 to tie with Ross Bain, Keith Horne and Uttam Singh Mundy. The V6 Renault made its debut in Autopolis this year and Armaan goes down in the record books as the first winner of the Grand Race in the V6 in Japan. The hosts, who earned six points, including a bonus point, from their previous league match against J&K, collected four points from the game against Haryana. Punjab face Delhi here in their third league match from October 18 to 21. In the second innings, Haryana commenced from their overnight score of 96 for 3. The middle order, barring Ankit Rawat, who had scored an unbeaten 81 in the first innings, collapsed like a house of cards. Ankit’s 64 was the only saving grace in a bad batting display by the visitors as they capitulated to 203 all out. Punjab, needing 110 to chalk out an outright victory, started off strongly with skipper Ravi Inder Singh and Sunny Sohal putting on an authoritative batting display. Brief scores: Haryana (1st innings) 158 all out; Punjab (1st innings) 251 all out; Haryana (2nd innings): 203 all out (Ankit Rawat 64, Sandeep Godhra 45, Sandeep Singh 37 n.o. ; Naresh Gogia 4-24, Sarabjit Ladda 3-57); Punjab (2nd innings) 110 for 1 (Sunny Sohal 57 n.o, Ravi Inder Singh 42, Karan Goel 5 n.o. ).